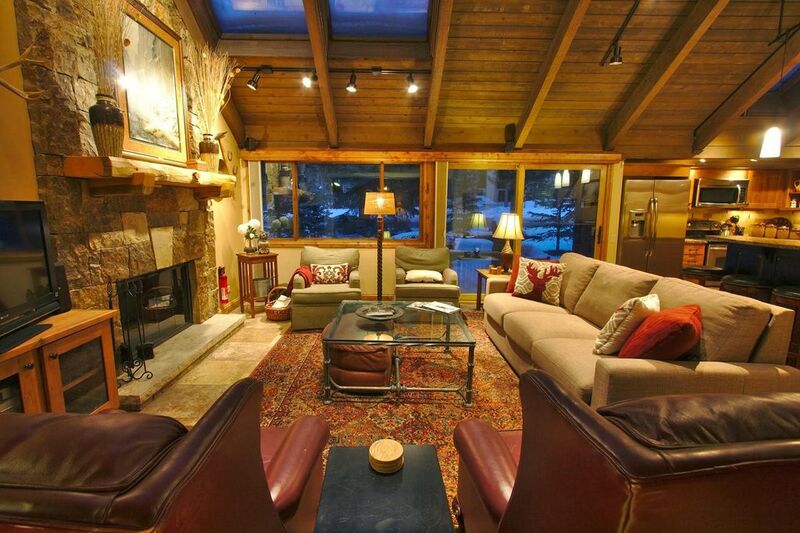 This is the ideal location for those that want to be close to skiing and historic Breckenridge downtown. About a 2 1/2 block walk to Peak 9 base with the QuickSilver high-speed lift, ski school, rental shops, childcare, medical care and more. Historic Main Street, also about a 2 block walk, is full of charming shops, museums and restaurants. For those that prefer to ride the free bus to town or the mountain, a bus stop is 1/4 block away. Connections to Vail, Copper Mountain, Keystone and A-Basin are available from the Breck Transit Center. To the rear of townhome complex is the Blue River with hiking, fishing and mountain biking. This is the original housing area when the Breck ski resort was first established, so is the most convenient location to both the mountain and town. There’s plenty of room to relax in this beautifully renovated, ground level townhome. The sunny great room features mountain décor, vaulted ceilings, custom alder woodwork, skylights, a wood-burning fireplace with natural stone and a handcrafted log mantle. The great room seating includes 2 leather recliners, a 4 person couch and 2 arm chairs situated around a coffee/game table. The entertainment center is equipped with a 50” HD TV, audio receiver, surround sound and DVD player. In addition to cable TV reception, the TV and soundbar are Wi-Fi connected and support Google Chromecast, enabling guest to cast programing from their smartphones. The SE wall of the great room is all glass and opens to the deck with patio set, seating benches and a gas grill to enjoy the Colorado outdoors, where it is not uncommon to spot our resident fox family. The kitchen is well equipped with everything you might need to prepare delicious meals. Opening to the great room, the kitchen has all stainless steel appliances, knotty hickory cabinets, leathered granite countertops and an eating bar with 4 stools. The dining room features an oak, handcrafted, farmer’s dining table, marble, stone top buffet, and secretarial desk. The townhome has 4 bedrooms and 3 full baths. The master bedroom features a log post queen size bed, flat screen TV and a private bath with 2 vanities and a walk-in shower. The 2nd bedroom is furnished with a queen size bed, a private sink vanity and a flat screen TV. Bunk rooms 3 & 4 are smaller size bedrooms each with a full size bed and a twin size fold down murphy bed. The guest bath was beautifully redone to include a full length Jacuzzi tub and a walk-in shower. In the great room is a fold out, queen size sofa and nearby the 3rd full bathroom with a tub/shower combination. Other conveniences include high speed Wi-Fi, a washer/dryer and private covered parking. The mudroom is large enough to store the group’s gear. The entry room has heated boot and coat racks… ahhh… dry, warm boots in the morning. It is hard to beat the location and comfort of our Mill Run Townhome. We're a family of 5 and have always enjoyed the Breckenridge area. The mountain and town are a live in the winter, the outdoors are abundant in the spring and summer, and the colors unforgettable in the fall. We’re certain you’ll enjoy our place as much as we do. We love this location in Breck, so handy to the mountain and all the shops and restaurants on main street. Being a ground floor townhome with no one above or below you was important to us, very quite and gives you immediate access to the large courtyard in the front and the large deck out your back door. We've worked hard to make it comfortable for families as is evident from reading our online guest comments. The interior has been completely gutted and rebuilt to be a beautiful mountain home that we are very proud of. With the master suite is a full bath with 2 sink vanity and large walkin shower. A second full bath with a shower and a jetted and heated Jacuzzi tub. A 3rd full bath with combination shower and tub is located near the living area. The guest bedroom also contains a vanity with sink. Seats 8 at large Amish carftsman style oak dining table plus seating for 4 at the bar adjacent to the kitchen. Wheelchair accessible on groundfloor only, which has a sofa bed and full bath. Other conveniences include wireless high speed Internet and private covered parking. In unit washer / dryer. The mudroom is large enough for the entire group to store their skis, boards and boots inside… heated boot racks... ahhh, dry, warm boots in the morning. 40” LCD TV with surround sound and DVD player. The kitchen, equipped with stainless steel appliances, knotty hickory cabinets, and granite countertops and eating bar, is open to the great room. The large dining room features a hand crafted, oak farmer’s table, marble top buffet and antler chandelier. Our trip to Breckenridge never happened due to our flights being cancelled twice. Therefore, we never got to experience our stay at this house. However, Toni and David were fantastic. They were understanding, responsive and flexible. They helped us find solutions and were very nice to deal with. I strongly recommend renting from them! Excellent and comfortable place to stay after skiing. Clean, warm and close to the lifts. Had a wonderful time. Thank you for your stay. Happy that you enjoyed your time in Breckenridge. We hope you find yourself planning another trip, we would love the opportunity to host you and your group again. Had a great time, condo was perfect for a quick adult getaway to Breck. Relatively short walk to lift, easy walk to town as well. Well equipped kitchen, living and dining area. Rooms with loft beds were on small size and didn’t have any drawers/storage for close, would be great for kids, that was only complaint. Hosts were wonderful as well, great all around long ski weekend! Thank you for your stay at our Mill Run Townhome. We are glad to hear that you enjoyed your visit. We appreciate your feedback. We have previously had dressers in those rooms and have recently updated to give more space without the top bunk having to be down, having lots of hooks, luggage racks and space under the bed for stowing bags. Trying to maximize the space. We would love to have the opportunity to host you and your group again. Thank you for your stay at our Breckenridge property. We work hard to keep our place in tip top shape and to be very honest and transparent about the details. We appreciate your feedback and would welcome you back in the future. Great room area is not massive, but certainly large enough with plenty of seating for our family of 6. And of course 4 bedrooms and 2 baths upstairs gave us plenty of space. We hung our stockings over the fireplace and cooked an Xmas dinner in the fully stocked kitchen. A lovely deck off the great room with sliders gave us a pretty view, but our favorite feature was the proximity to the Breck bus line. It's only steps away. Perfect for a large family ski trip. We loved our stay! Thank you for the nice review. I'm happy our place worked out well for you and your family. We hope you will keep us in mind if you ever plan another trip to Breckenridge. We had a great weekend stay in Breckinridge! The condo was well equiped and the perfect size for the seven of us. The location was perfect and allowed us to easily walk into town or use the free shuttle. You'll enjoy some of the best skiing in the Rockies, Peak 9 and 10 are only a block away with Quick Silver high-speed lift, ski schools, rental shops and childcare. Enjoy the main street restaurants, shops, and museums all within walking distance. In the summer, go hiking out your back door or ascend one of several 14,000' peaks nearby. To the rear of the complex is the Blue River with hiking, fishing and mountain biking. Golf at Breck's newest course, a 27 hole mountain course that is beautifully maintained. Sledding and Ice Skating at Breck's new indoor and outdoor skating arenas. Large, year around, indoor Recreation Center in Breck with large children’s pool and water slide, tennis, racquetball, basketball, weight training, aerobics classes and more. A free shuttle bus stop is 100 feet away, for access to Peak 7 and 8 and connections to Vail, Frisco, Copper Mountain, Keystone and A-Basin. Also available, dinner sleigh rides and cookouts, mining tours, art studios and galleries and several wonderful spas. There is definitely something for everyone in the family to enjoy and not enough time to do it all!